Digital revolution and emerging technologies infiltrate almost every sphere of our lives. Using social media, doing shopping, booking a vacation online, paying bills with your device, buying property are just a few examples of how our life has moved to the internet. With nearly every business sector being shaken up by technological developments, it is important for organizations to keep pace to succeed in the digital future. Smarter technology usually implies easier and faster processes, saving the most valuable resource available to us – time. Real estate business did not elude the digitization process as well. Technological advancements in the property sector are so profound that they deserved a separate term – PropTech. PropTech is the combination of “property” and “technology”. PropTech is all about technological innovation in real estate business and implementing tech solutions to solve the challenges faced in this sphere. Most of the PropTech trends are not yet ready-made solutions, but rather predictions of how real estate business will be digitally revolutionized in not so distant future. The potential of digitizing the property industry is enormous. PropTech innovators strive to make the whole process of renting, selling, buying real estate much faster and more convenient for both a realtor and a client. Some digitization and subsequent enhancement of real estate processes can be done today. How? By getting rid of the paper flow using reliable electronic signature software, e.g. KeepSolid Sign. There’s much paperwork involved in real estate transactions, like settling listing agreements, offer letters, contracts etc. Digital document flow boosts the speed of your overall real estate business process. It is crucial if, for instance, a property is in a multiple offer situation and you are striving to win the deal and get documents signed as soon as possible. Saving time on all the paper-related work, including travelling around the city to have a contract signed, you can pay more attention to your clients and get more deals closed (a dream of every realtor, yeah?). You don’t necessarily need to be at the office to send or receive a signed agreement, this can be done on the go, from wherever you are, on any device, allowing you to become more mobile when trading property. Better customer service is another benefit of implementing electronic signature PropTech. 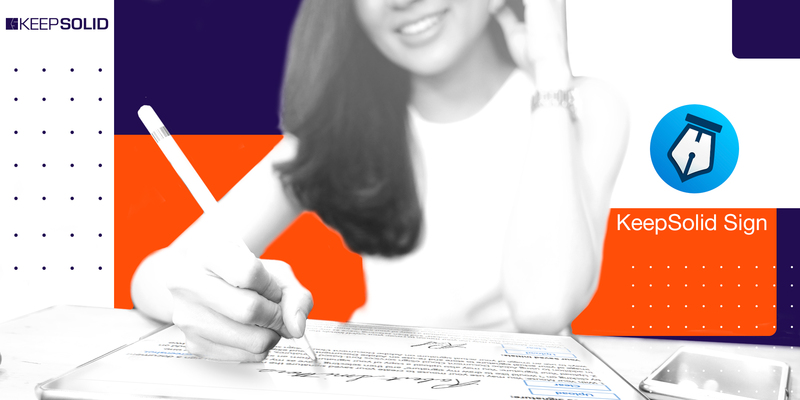 Signing a stack of papers can be anxiety-provoking. 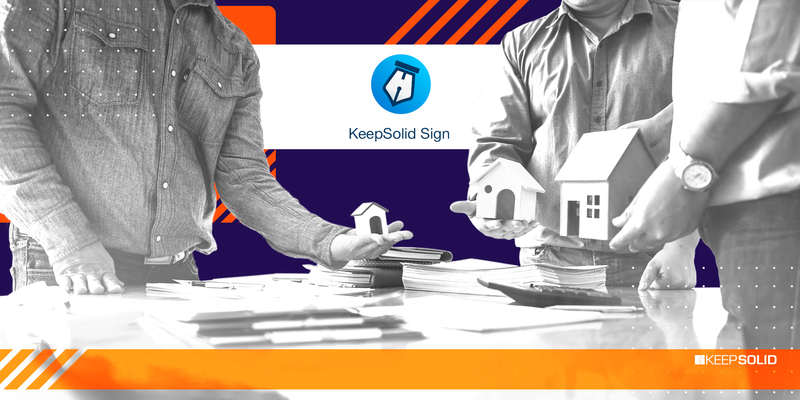 KeepSolid Sign lets your clients esign documents free in a few clicks and without registration. 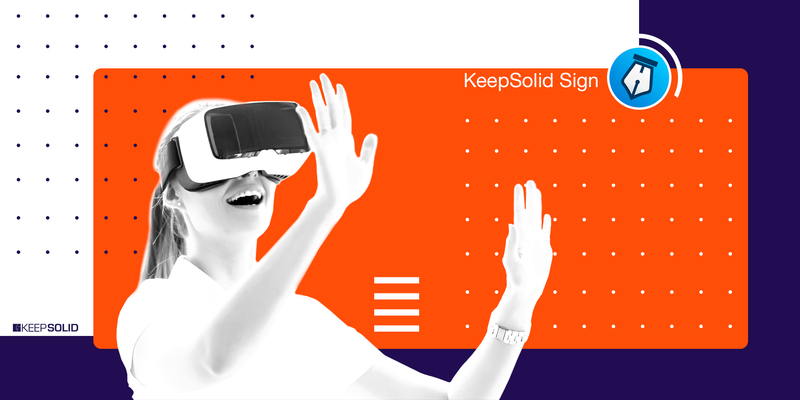 Besides, with its top-grade encryption, KeepSolid Sign secures all document transactions and all the sensitive information that your clients are sharing. Virtual Reality is one of the dominant PropTech trends, providing a great opportunity for property presentation to prospective buyers. As a real estate agent, you may deal with houses still under construction. There’s not much to show to your clients yet, just the premises plan and a verbal description of what it’ll look like. No matter how vivid your description would be, your clients may still be more perceptive to visual presentation rather than the verbal one. As the saying goes, a picture is worth a thousand words. This is where technology comes in. VR companies like VR Global, Matterport, and the like, provide a perfect solution, helping clients get the feel of the building and make up their mind faster. VR can come in handy not only in the off-plan property sale, but if, for example, your clients can’t attend the location for some reason. So, instead of travelling to the property, you can provide them with a virtual tour. A really convenient PropTech innovation. Though mostly associated with cryptocurrency and Bitcoin as the brightest example of the kind, blockchain technology in fact stretches far beyond and is now penetrating real estate. It has great power to transform the industry. Blockchain is a shared, unalterable ledger recording any type of transaction. With the technology that lies in its core, blockchain eliminates any kind of fraud, building confidence in its validity among all involved parties. Moving transactions to a digital platform of blockchain technology would make them less costly, faster (due to eliminating many of the intermediaries involved) and, as stated above, more resistant to fraud. Selling real estate with Bitcoin is no longer a dream. First transactions of such kind are already happening. Spain witnessed the first such real estate purchase this January, with a flat bought for 40 bitcoins. Dubai is heading for broad PropTech and blockchain implementation and is planning to digitize all its administrative data by 2020, and become the world’s first blockchain-powered government. It wants all bill payments, visa applications, and license renewals, which account for more than 100 million documents per year, to be transacted digitally using blockchain. Impressive, isn’t it? With all the technological changes penetrating almost every aspect of our lives, the real estate sector is no exception. Technology enters almost every aspect of real estate business operations: from the first meeting with a client to the contract signing process. Keep abreast of the PropTech trends and implement the most efficient tools the new technology offers to go digital, maintain competitive edge, and succeed in the modern high paced environment.